Education and race: there aren't too many issues that are more divisive in our country at the moment. The Indiana Repertory Theatre's current Upperstage production, Pipeline, tackles them both. 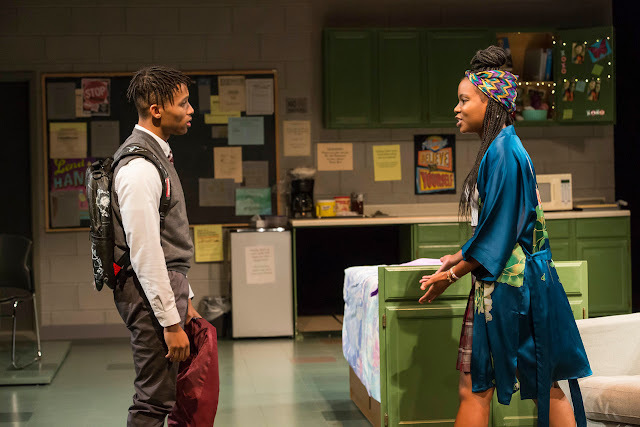 The 90 minute play keeps a frantic pace as Nya, a public school teacher, finds out her teenage son has gotten into a fight at his private school. The show, written by Detroit-native Dominique Morisseau, brings to the stage the debate of public vs. private education and the role race plays in that conversation. In addition to being a playwright, Morisseau was a teacher for years and that experience comes through in her writing. She writes about the struggle from the point of view of both parent and teacher with equal weight. One of the major strengths of the show is the character of Omari, played with compelling vulnerability by Cole Taylor. In the hands of a less talented playwright he could easily have been a caricature of an angry young black man. Instead he is complex, emotional, confused, angry, loving, innocent, frustrated, and so many other things. In other words, he feels real. His depth gives the audience a window into his world. The set works as a teacher's lounge, classroom, living room, hospital, and dorm room. 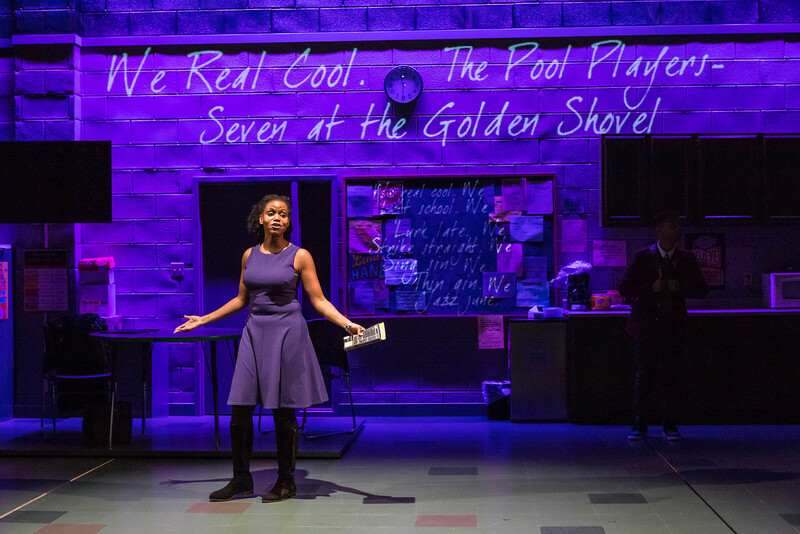 It uses multimedia screens to project security cameras, texts, and videos as well as lines of Gwendolyn Brooks' poetry. Director Raelle Myrick-Hodges keeps the intensity of the play intact for the whole show by zoning in on Nya's escalating anxiety. Nya (Aimé Donna Keely) is in the midst of the story. It's her reactions that we follow as her life intersects with her ex-husband, her son's girlfriend, her coworkers, her students and her son. Her stress level rises and her parental fear is palpable. The production holds no punches and doesn't shy away from hard issues. It does what the best type of theatre should always do, makes the audience look at the world from someone else's viewpoint and opens up the door for a new conversation. 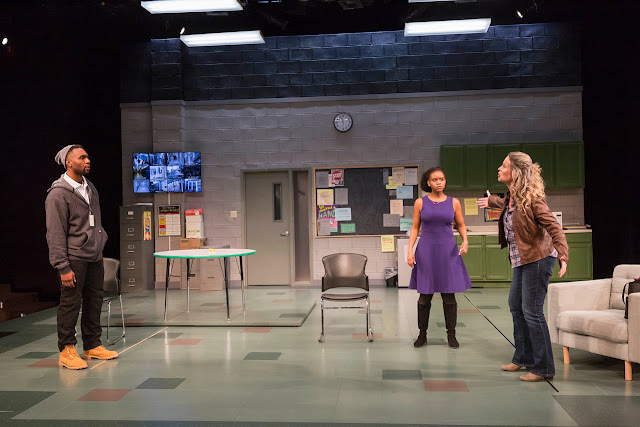 The Indiana Repertory Theatre is located at 140 W. Washington St., Indianapolis, one-half block west of the Circle Center Mall between northbound Illinois St. and southbound Capitol Ave. "Pipeline" runs until Nov. 11 on IRT's Upperstage. It includes strong adult language and some adult situations. It is 1 hour 30 minutes, with no intermission. To purchase tickets or find performance times, call (317) 635-5252 or order online at www.irtlive.com.